There is a lot resting on a good waterproof backpack. How well the bag is designed impacts your comfort, but also your safety too. When going on a long hike or just a short﻿ day trip, we are often at the mercy of the elements. If important gear, clothes, or worse work documents get wet we can be in big trouble. That's why choosing the best waterproof backpack is so crucial. In order to make your search a little easier, I've chosen my top waterproof or water resistant backpacks available online. I'll be looking at the construction, the design, and the versatility to make my choices. We separated them out in two different sections with the commuters section first. For those hiking enthusiasts click the link where it says, "Best Waterproof Backpacks For Hiking." In both cases, we only chose backpacks with an established reputation where we have found their packs to hold up well and maintain quality, while still at the same time shedding out the rain. Whether you are using this pack for your daily commute to the office or for your next hiking excursion, we believe you will like these packs. We put a premium on packs that look nice, are comfortable, and most importantly block out the rain from getting inside your pack and ruining your documents/electronics. In all three cases, you will find great, handy packs that with excellent interior and exterior pockets for all your books. We valued easy of use and want to make sure you laptop can be slided in and out with any issues (and staying dry in the process). We loved this backpack because of it’s slick design and outstanding comfortability. The fabric is great and appealing while still offering excellent water resistance. The pack comes with an excellent array of pockets for on the inside to easily place your laptop, books, and papers. It makes for pulling them out effortlessly. Beyond that, I like that the backpack has excellent zippers that won’t bust open if a thief uses a sharp tool. Amazingly, this is backpack also is offered at a very affordable price as of the time of this article. For the high quality design and excellent materials used, we believe this backpack is a steal of a deal and our top pick for travelers and commuters. We know you will like this sleek looking waterproof resistant bag. The Under Armour Storm Hustle II offers another nifty water resistant pack with some unique aspects to its design. First, for those usual commuters who like to take their work with them wherever they go, there is a 15" soft-lined sleeve for laptops. The front is also water-repellent for any valuables you might take with you be it papers or electronics. The bag has a very simple layout with no chest strap, so be careful when carrying very heavy loads as you will miss that weight distribution. As well as being well constructed overall, the bottom panel is very tough for travellers that aren’t very careful when setting their backpack down. Yet another great business laptop backpack at an affordable price. This one really battled with our top choice, the Kopack Slim, as it also a nice sleek look with a couple cool looking colors to choose from. It has a really nice polyester lining that makes the backpack repel any water that comes its way. Inside, the pockets are very handy for all your belongings to quickly place in and take out trouble free. The zippers seem to work very effectively without error. If style is important to you, they sell a couple nice black or grey colors to choose from. Take a look at it and you will find that customers love this backpack and you can purchase it for a very affordable price! Before I begin, it’s worth mentioning that if you already have a hiking backpack you’re comfortable with and don’t wish to swap it out for a waterproof pack, it’s worth considering a waterproof cover for your bag. Many of the top brands for the top hiking backpacks have some level of water resistance to them so it is not like you are making a huge sacrifice to buy a rain cover and order a top brand. Personally, I really like this UltraLight Raincover from Osprey (and we know you will too). By the way, we created an Ultimate ﻿Guide of the Best Hiking Backpacks available on the market right here! We know you are here to see the best waterproof ​hiking backpacks and we have done just that. We compiled an excellent list of the tried and tested waterproof hiking backpacks (plus an honorable mention). The Patagonia Black Hole backpack is as serious as its name suggests. This sleek black bag is one of the best waterproof backpacks available online. Its glossy aesthetic appearance is a walking advertisement for its water repellent construction. Though the high-shine finish may not be for everyone. Made from ripstop fabric, the P﻿atagonia Black Hol﻿e is a tough bag that will see you through all the elements, no matter the load. A chest strap will also ensure there isn't too much movement or slippage on the move. You'll be grateful for this extra stability if the heaven's open and the walking floor becomes slippery. Top-loaded and well-padded, you can trust this pack to keep all your important goods safe wherever your off to. One of the more expensive packs on my list is the Aqua Quest Sport 30 Pro. This backpack is 100% waterproof but is still lightweight compared to some other waterproof models on the market. The use of ripstop fabric makes this a durable choice, while the range of pockets gives this pack a versatile edge over some of its competitors. The straps are broad, well-padded and comfortable while the chest and hip straps add that all-important stability. This is a serious backpack for hikers who expect very wet conditions and who are carrying valuables such as HD cameras and laptops. This roll-top 100% waterproof backpack from Phantom Aquatics makes the cut as the last of my five choices in the quest for the best waterproof backpack. This pack is one of the more comfortable options available with its padded shoulder straps and great airflow at the back. With all straps connected, it also fits snugly to the body. Though it is totally waterproof, there are some problems with condensation on the inside in hotter conditions. So keep that in mind if you plan to use this bag in warmer environments. The roll-top means your possessions are especially secure, while the choice of pockets allows you to organize the bag perfectly to your needs. The top feature of this backpack is that if dropped in the water it floats. For those clumsy hikers like myself, that’s a useful benefit. The Sea to Summit Flow Backpack 35L is a fully waterproof backpack with a few excellent features. The waist strap is removable to suit your needs, and there is a hydration pouch separate from the dry compartments. It is well ventilated and has lots of padding on the back panel for increased comfort. This pack is very large and does appear bulky at first glance. There are also a lot of straps that could annoy buyers who prefer a cleaner profile. However, all that bulk and padding makes it a durable bag, and something of an investment if you plan on being out in wet conditions. The importance of a pack that will keep your possessions safe cannot be overstated. We take risks with our personal safety and our goods when we're hiking or just out and about, and the weather is an ever changing beast. Therefore, it's important to invest in a backpack that will keep you and your valuables safe. I've looked at a broad range of packs above. Buying a nice backpack should be considered an investment, so it's important to consider your personal needs before making your final choice. Think about space required, the conditions you plan to be in whether it be hiking or just daily commutes or short travels. If you travel or live in a place where it rains from time to time, it would probably be best to go with the top waterproof backpack, the Kopack Slim Business Backpack. Whatever your choice, we have no doubt it will be a good one. We hope you liked our choices for the best waterproof backpacks in 2018. Let us know what water resistant or waterproof backpack you like best. Ready to take your next hiking journey serious? 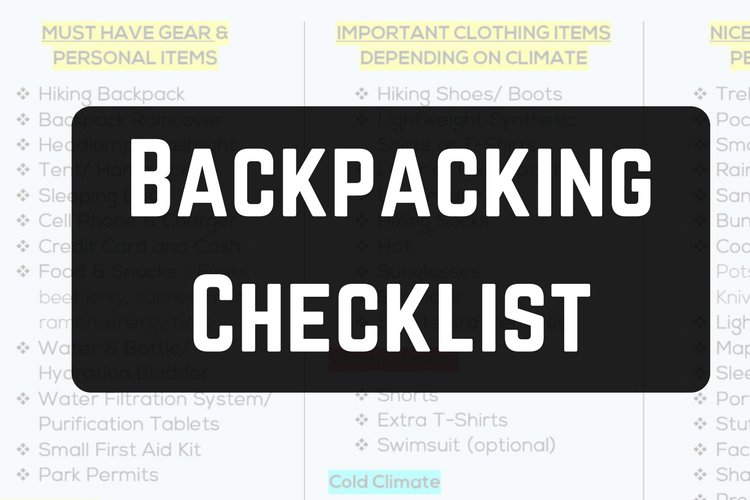 We put together an ﻿﻿﻿﻿In Depth Guide﻿﻿﻿﻿﻿ of the Top Hiking Backpacks for any duration. Check it out﻿ ﻿﻿﻿HERE﻿﻿﻿﻿.